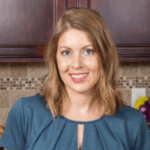 Published: Jul 10, 2017 · Modified: Apr 12, 2019 · By Jen Sobjack · This post may contain affiliate links. 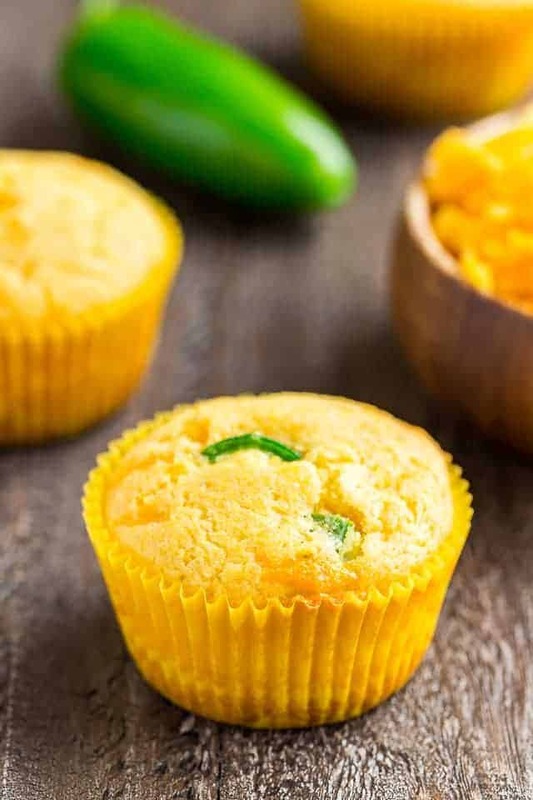 These Cheddar Jalapeño Cornbread Muffins are tender, moist, and dotted with fresh jalapeños and cheddar cheese. This recipe is so delicious! It seems that I bake more sweet than savory things. It just goes to show that I have a love for sweets. But hubs gets so tired of having sweets around the house and often asks me to bake something savory. I’m not really that great when it comes to being creative with savory recipes. It’s hard for me and I don’t understand it. And came up with something so simple and easy; Cheddar Jalapeño Cornbread Muffins! 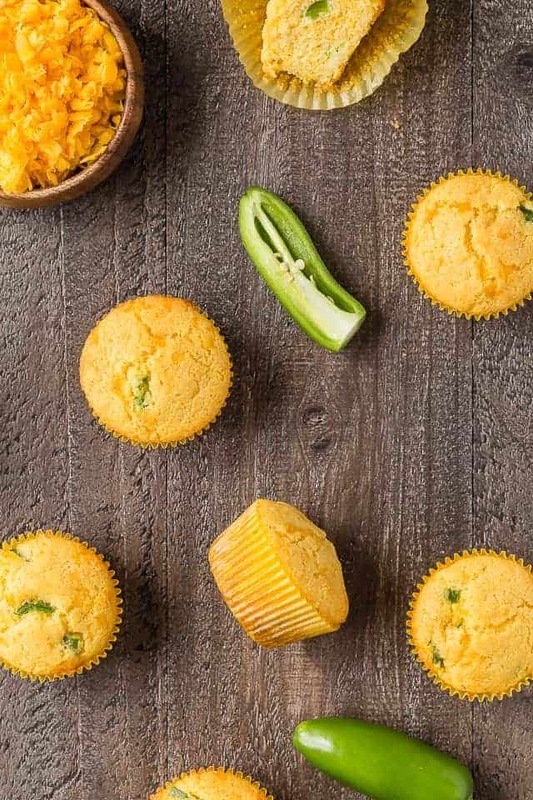 I loved this cheddar jalapeno buttermilk bread and decided to turn that into a muffin with the addition of cornmeal. It may not be very creative but they’re darn delicious. The muffins are made like your ordinary muffin. Mix the wet ingredients separate from the dry ingredients and then mix it all together. Don’t over mix once you combine them. Just fold the batter together until the dry ingredients become moist. The dry ingredients are no more than cornmeal, flour, sugar, leavening, and salt. Super duper simple. For the wet ingredients, you need buttermilk, butter, eggs, and oil. All of these ingredients will make the muffins extremely moist. You won’t need a huge glass of milk in order to swallow a bite from these guys. I can’t stand dry cornbread! The final touch for these moist and tender muffins is, of course, the addition of freshly chopped jalapeños and shredded cheddar cheese. Gently fold these in after the dry ingredients are moistened. Fill your muffin pan with the batter and bake for 5 minutes 425ºF. Then turn the heat down to 350ºF and bake for an additional 15 minutes. Watch the muffins closely and remove them as soon as they are done. Over baking will dry them out. Take them out of the pan immediately once they are done. The bottoms will become soggy from condensation, otherwise. Let them cool for just a few minutes before serving. 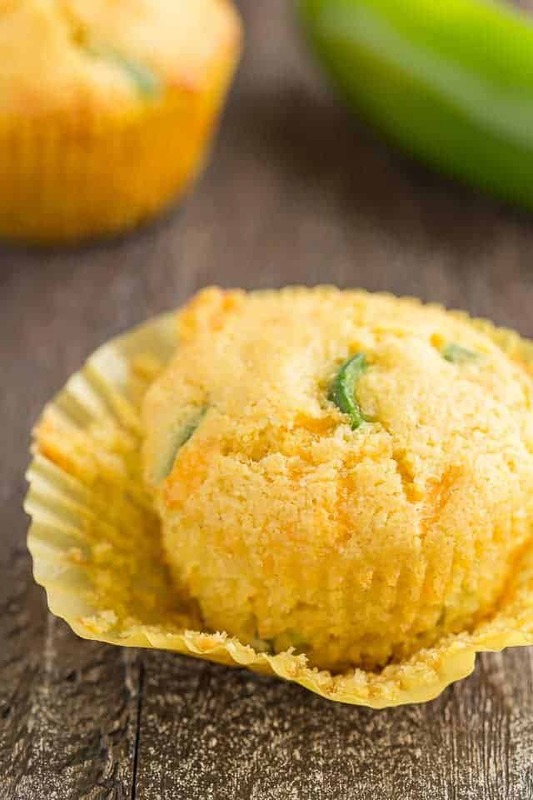 Enjoy these cheddar jalapeño cornbread muffins alone or on the side of your favorite dish. Chili maybe? Preheat oven to 425ºF degrees. Spray 14 muffin cups with cooking spray or line them with paper liners; set aside. In a large mixing bowl, combine the cornmeal, flour, sugar, baking powder, baking soda, and salt; stir with a whisk. In a separate bowl, combine the buttermilk, butter, eggs, and oil; stir with a whisk. Add milk mixture to cornmeal mixture; stir just until moistened. Fold in the cheese and jalapeños. Spoon batter into prepared pan; filling each cup 2/3 full. Bake for 5 minutes. Reduce the oven temperature to 350ºF and bake for an additional 10 to 15 minutes or until a toothpick inserted into the center comes out clean. Remove from pan immediately and allow to cool for 10 minutes before serving. Muffins will stay keep for up to 1 week stored in an airtight container at room temperature. They will keep for up to 3 months stored in the freezer. Thaw in the refrigerator overnight. Can you use cornmeal mix instead of the first six ingredients? I just used two boxes of Jiffy Cornmeal Mix and it turned out great! I did add another egg though. I hope you get the chance to try the recipe as it is. They taste so much better made from scratch! Oh my gosh, these things look AMAZE. The perfect side right now for summer grilling and will carry over perfectly into chili season! 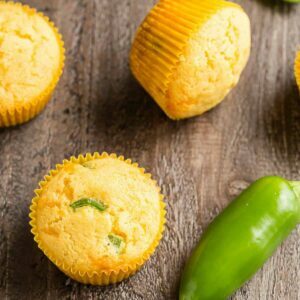 I’m not a huge jalapeno fan, but my husband is and would die if I made him these cornbread muffins! They look lovely! Same here. I only make spicy food for hubs. I like the taste but my stomach doesn’t like the spice. He likes it that way, more for him. A small bowl of beans and 4 of these muffins and I set for dinner. Your pictures have made me very hungry! Jen, I am the same way with the sweet action! And, you are so savory creative… loving this. Jalapenos happen to be my biggest weakness! These cornbread muffins look absolutely delicious! Love the cheddar and jalapeño, amazing flavour combo! Corn muffins are such a staple in our house. A nice change from bread…and they go great with so many meals. LOVE this! I completely agree, Aimee. We have them quite a bit as well and it’s always nice to switch up the flavor some. Thank you for reading! I’ve been craving cornbread like it’s nobody’s business recently, and these muffins look amazing! Love that you added jalapenos and cheese…mmm! I hope you get your cornbread fix. You will love the cheesy spicy combo in this one. These muffins look fantastic, Jen! 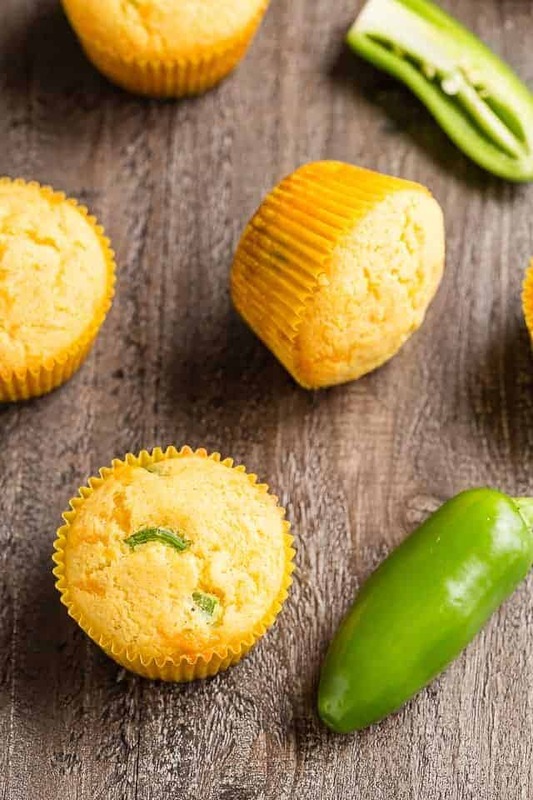 We love cornbread especially when they’re made into cute muffins like these 🙂 The jalapeno and cheddar in here sound irresistible! Pinned! Thank you for pinning, Kelly. Cornbread really is the best! I would totally eat these for breakfast! So cute! I LOVE savory muffins! These look so so moist and soft inside and I love the combo of cheddar and jalapeno—also I have a ton of jalapenos that need to be used up and I think I just found the solution. LOVE these. 😀 Pinned. Thank you so much, Sarah! I hope you enjoy the muffins.